Talking History: Black Senators Celebrate Their Legacy : It's All Politics To mark Black History Month, South Carolina Sen. Tim Scott brought five current and former African-American senators together for a historic event at the Library of Congress. 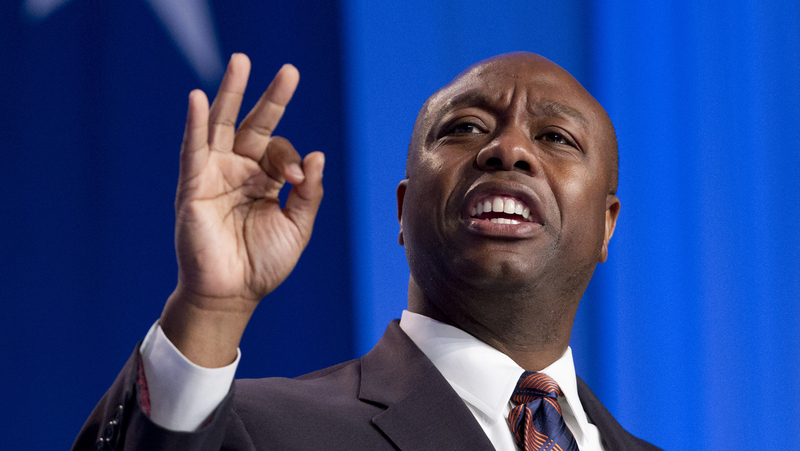 Sen. Tim Scott, R-S.C., speaks during the Values Voter Summit, held by the Family Research Council Action in Oct. 2013. Five current and former black senators appeared together Tuesday at an unprecedented event celebrating the legacy and contributions of the nine African-Americans to serve in the U.S. Senate. The event, held at the Library of Congress to mark Black History Month, was the brainchild of Sen. Tim Scott, R-S.C. The only Republican at the summit, Scott was joined by Democratic Sen. Cory Booker of New Jersey and former Sens. William "Mo" Cowan of Massachusetts as well as Roland Burris and Carol Moseley Braun, both of Illinois. The nation's first two African-American senators, Hiram Rhodes Revels and Blanche Kelso Bruce, both of Mississippi, were also honored at the event. Barry Black, the Senate chaplain who served as the emcee of the event, noted the historic nature of the gathering. "I don't think in the history of the republic we have had this many African-Americans who served in the United States Senate together in one room. So this is a history-making event," said Black, who is also the Senate's first African-American chaplain. The two other living black former senators — President Obama and Edward Brooke, a Republican who represented Massachusetts from 1967-1979 — were invited but were not in attendance. The panelists kept the focus on their rare, shared experiences as African-American senators, rather than on philosophical or political differences. The group even praised Scott for bringing them together. "It's remarkable when we look around this country at the progress we've made," Scott said. "I thought perhaps we'd have an opportunity for us to take a look at the history of our country and celebrate our success in a nonpartisan way." In a lighthearted nod to the contentiousness of Washington politics in recent years, Scott continued, "Can I get an amen out there for 'nonpartisan way?' "
Jokes aside, there were genuinely powerful moments. Cowan, the Massachusetts Democrat who served briefly in 2013, told the audience that he never had the dream of holding elected office but hopes Scott, who's up for election to a full term this year, wins. "Even though there's only one of us on the proverbial other side of the aisle we represent a range of political interests and viewpoints. And I think that's good for the African-American community to see," said Cowan, who was appointed to the Senate last year and served a little more than five months. "I am a Democrat — and I know this is a nonpartisan event — but I'm going to say something that I hope is not controversial. I hope my good friend is successful in his campaign, because I love the fact that the black experience is reflected on the other side of the aisle." The panelists were asked about the biggest challenges they faced in becoming senators. Moseley Braun, an Illinois Democrat who was elected in 1992 — known as the "year of the woman" — cited the confluence of race and gender. "Racism and gender bias give rise to hurdles, assumptions, misimpressions; and preconceptions are sometimes very difficult and if not impossible to overcome," said Moseley Braun, the only woman on the panel. Burris pointed to some of his early attempts to run statewide in Illinois in the mid-1970s, when money and race played major factors. "The fact that I had to overcome the racial issue, even blacks saying, 'Burris, you can't win, they're not going to elect a black man in Illinois to take care of their money.' I had to overcome that." Booker, the most recently elected black senator, cited himself as his biggest hurdle. He acknowledged that he didn't have to fight the same fights as those who came before him. "If you were born after the modern civil rights movement, if you are born in my generation, you stand on the shoulders of giants," said Booker, a former Newark mayor. "My prayer is that my generation, especially, can look at people on this stage who fought battles that I will never fight, never see, in order to give us these opportunities and privileges. That we prove worthy of those privileges that we have not by paying anything back, but by paying it forward."